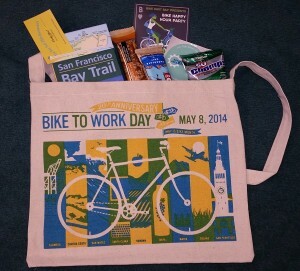 You’ve enjoyed picking up the famous Bike to Work Day musette bags, chock full of swag & snacks. 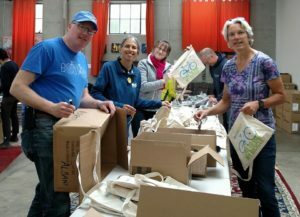 Help stuff those musette bags for our Energizer Station so hundreds of your friends, neighbors and passers-by can enjoy the fruits of our labor! Local businesses BLUE HERON, BUA LUANG, TAY TAH CAFE , FERN’S GARDEN and BIKE LINK ARE AGAIN DONATING SPECIAL GIFT CARDS OR COUPONS FOR OUR BIKE MONTH VOLUNTEERS, IN APPRECIATION FOR YOUR TIME AND SERVICE TO THE COMMUNITY!!! 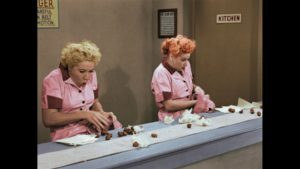 You’ve seen Lucy & Ethel in their famous assembly line – help us make ours more fun & successful by joining us! This important pre-Bike to Work Day event is a ton of fun for all ages. Fast-paced assembly line is a great experience for kids. Snacks provided. You’ve been getting the bags for free for years, now see how it’s done and boost your karma! Let Elizabeth Vahlsing know if you can help out. The musette bags are always filled with swag but they don’t stuff themselves! Help get them that way! If you want to connect with others to bike or BART to Sports Basement, leave a note in the Comments section of this post.